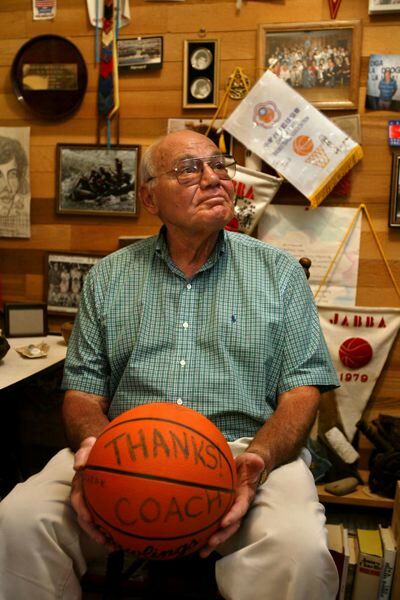 Former University of Portland basketball coach Jack Avina died Oct. 4 in Lafayette, California. He was 89. Avina had the longest run of any head coach in the school's 96-year basketball history, overseeing the program from 1970-87. The Pilots played as an independent his first six seasons before joining the West Coast Athletic Conference in 1976, the league in which they participated during the remainder of his tenure. Avina's win-loss record wasn't great — 212-243 overall and 64-86 in WCAC play. His glory years were from 1977-82, after the Pilots joined the WCAC. Featuring such players as Rick Raivio, Darwin Cook and Jose Slaughter, Portland put together five straight winning seasons and an 88-49 record. The Pilots beat Oregon State twice in three meetings when the Beavers, coached by Ralph Miller and led by such players as Steve Johnson, Mark Radford, Ray Blume and Lester Conner, were ranked among the nation's top 20. Portland won 94-86 in 1979 and 68-53 in 1981. Avina later coached in Turkey and Brazil and gave clinics throughout the world. His biggest impact at UP came in the interest of molding his players into men. "To that generation of guys, Dad changed their lives," says Joel Avina, who played for his father and coached with him for eight years on The Bluff. "He pushed them to be what they could be. The end result is, we got a lot of college graduates who have kids who became college graduates. "Dad was the first college graduate in his family. Every one of his children graduated from college. He wanted the same for his players. When we recruited, that's what we talked to (the prospects) about. 'You can get an education and change your family's trajectory.' He was right. He did, and they did." A memorial service for Avina will held on Sunday, Nov. 11, from 1-4 p.m. at Riverside Golf & Country Club.